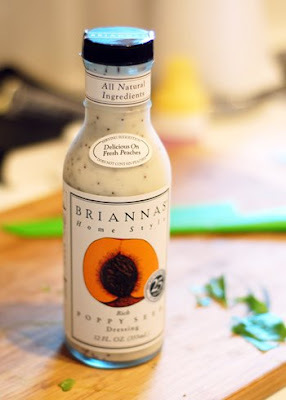 A friend fixed dinner for me the other night, and asked me, "Are you okay with Brianna's Poppy Seed dressing?" Um . . . Am I okay with sunshine and cookies? This dressing makes salad taste like candy, and I love it. Tonight, I wanted a MEAL of a salad. So I topped a big spinach salad with chicken thighs, goat cheese, pear tomatoes, toasted pine nuts and Brianna's Poppy Seed Dressing. 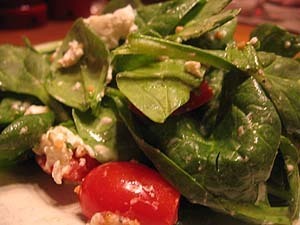 Spinach Salad with lots of yummy stuff Spinach Chicken thighs Pine nuts Pear Tomatoes Blue cheese crumbles Brianna's Poppy Seed Dressing For chicken thighs: Preheat oven to 350 degrees. Heat canola oil in oven safe skillet on medium heat. Lightly dredge chicken thighs in flour and place in skillet when oil is hot/shimmering. Sear for 2 minutes on each side, then place skillet in the oven for 15 minutes. Remove from oven, slice and serve.